Designed to look good anywhere, this direct vent gas fireplace doesn’t need a pre-existing fireplace in which to sit. The venting can be passed through a wall or ceiling to the outdoors, providing the air needed to circulate around the fire box without the need for a chimney. Like the other fireplaces in our range, we have done everything we can to ensure excellent fuel economy and plenty of heat output. The Slayton 42s benefits from 75% natural gas efficiency and 75% LP gas efficiency, providing a cost-effective solution to your heating requirements. 42,000 BTU/hr input for natural gas and 42,000 BTU/hr input for LP gas ensures plenty of heat, alongside low fuel costs. The Slayton 42S now comes with a split flow option to turn down the BTU/hr to 15,000 BTU/hr for LP and natural gas. The sensitive remote control allows this direct vent gas fireplace’s temperature to be minutely controlled. A good selection of refractory linings, glass media kits, and screen fronts enable this fireplace to be customized to meet your exact specifications. A wide range of styles ensure it looks equally good in contemporary or traditional dwellings – simply pick the options that fit best with your existing decor to create a stunning accent in your home. Each fireplace is made of hard-wearing, high quality materials and created to a tough build specification, ensuring a durable product which benefits from excellent longevity. Our contemporary Slayton 42S offers affordable elegance that combines innovation and design with function and efficiency. 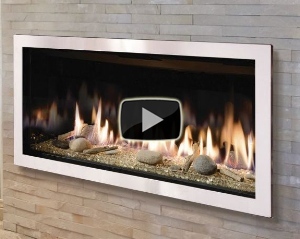 The Slayton 42S linear fireplace offers a sleek modern design that will revolutionize your contemporary design ideas. A variety of fireplace sizes, media choices, split flow option, and accent lighting will make the Slayton 42S a stunning addition to your home.